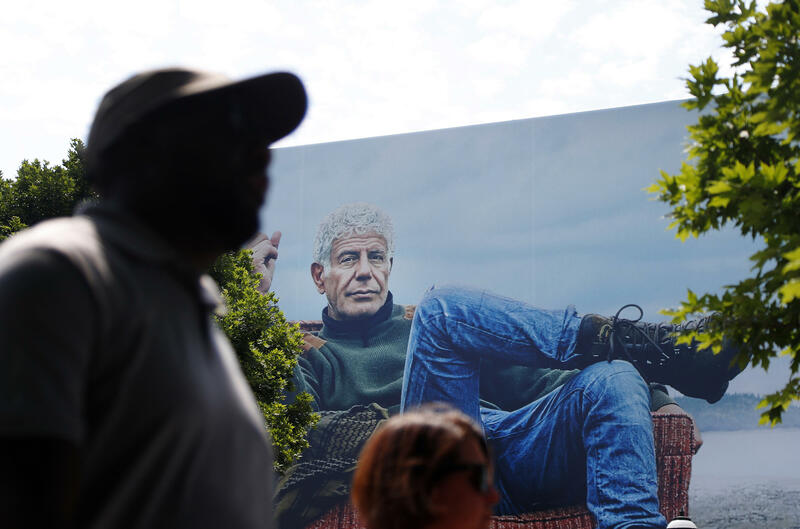 Bourdain, 61, was found dead on Friday in France, where he'd been working on an episode of his show Parts Unknown which explores culinary traditions around the world. The chef, food and travel writer and humanitarian was found dead on Friday while with a production crew on a shoot in France for one of his food travelogues. The cause of death was suicide. "If you're from a marginalized, dehumanized community, you know what Anthony Bourdain meant," tweeted Mohammad Alsaafin. "To Palestinians, Iranians, Libyans, undocumented immigrants in the US, abused women...what a loss." What a loss indeed. Food historian Michael W. Twitty won a coveted James Beard award earlier this spring for The Cooking Gene: A Journey Through African American Culinary History in the Old South. He wrote on Twitter, "For a Black man that has walked the plank for being highly critical of the food world so white, #Anthony Bourdain was special. He called Africa the cradle of civilization, took his cameras to Haiti, honored t he hood with Snoop, broke bread with Obama like a human being..."
Obama and Bourdain met when both were traveling in Southeast Asia to share bowls of bun cha, a North Vietnamese specialty of spicy pork patties with noodles in a garlicky broth. The people in the restaurant—once they got over their shock at seeing the leader of the free world happily slurping noodles at a nearby table — clearly loved that Obama was eating and enjoying their food. "This is killer," Obama told Bourdain, as he dove in for more. Food writer Andrea Nguyen, whose cookbook on the Vietnamese national soup, Pho, also earned a James Beard award this year, tweeted after that memorable dinner, that the table at which the president and Bourdain dined "was encased like a museum piece at the restaurant." Bourdain, she said "did much for overlooked causes and cuisines, including that of Vietnam. RIP anh [brother] Tony." Bourdain saw food as not just sustenance — although sustenance was important — but as a way to convey a message of acceptance, respect, comfort. Parts Unknown got an award from MPAC (the Muslim Public Affairs Council) for its episode on Israel and Palestine. In his acceptance speech, made by video, Bourdain said, "The world has visited many terrible things on the Palestinian people, none more shameful than robbing them of their basic humanity." Bourdain's death revealed another talent most of us knew nothing about. Laila El-Haddad, his co-author of The Gaza Kitchen: A Palestinian Culinary Journey, posted a photo on Twitter of Bourdain with her and her tiny daughter. "He was a master baby whisperer, and a master storyteller, having rocked my 7 month old to sleep in the middle of shooting our episode." "Let's not forget that Anthony Bourdain was one of the few prominent media personalities who regularly humanized Muslims and Arabs as regular, everyday people-without politicizing their lives or stories," tweeted Khaled Beydoun, a law professor at the University of Detroit Mercy, and author of American Islamophobia. Closer to home, Bourdain was an early supporter of #MeToo, noting he'd met several women who'd told him awful stories of abuse. In an interview with The Cut, Bourdain confessed he'd partially awakened to how widespread the issue of male predation was when his girlfriend, Asia Argento, confided she was one of disgraced film maker Harvey Weinstein's accusers. "I stand unhesitatingly and unwaveringly with the women," he wrote on in a 2017 essay on Medium. And he meant not just in the film industry: "Right now, nothing else matters but women's stories of what it's like in the industry I have loved and celebrated for nearly 30 years..."
He also clapped back at the country's growing anti-immigrant, especially anti-Mexican, sentiment. On his blog in 2014, Bourdain noted that, "Americans love Mexican food ... Despite our ridiculously hypocritical attitudes towards immigration, we demand that Mexicans cook a large percentage of the food we eat, grow the ingredients we need to make that food, clean our houses, mow our lawns, wash our dishes, look after our children. As any chef will tell you, our entire service economy—the restaurant business as we know it—in most American cities, would collapse overnight without Mexican workers." It's noticing things like that — and being unafraid to voice those observations in his books, blogs and on his television shows, that made Anthony Bourdain beloved, even revered, by the many communities of marginalized people that he visited, touched and supported.